Our Dead Sea Salt is 100% pure, and come Dead Sea in Israel and has the highest mineral content. 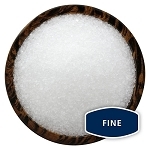 Our Premium Dead Sea Salt is the cleanest, most natural unrefined Dead Sea salt on the market. lotions and other beauty products, as well as for relaxing bath salts and soaks. and mixes well with essential oils. DEAD SEA SALT - Sample 1 oz.